You will probably know most of those places. I just want you to realize that they can be also used as a source of b2b leads for your outbound campaigns. Most of those platforms will show you companies, not people. Some of them will show you people as well. But remember that in the process of defining your ICP, you should focus more on types of companies and business models than on the very buyer personas. So, by searching those platforms, you can start from finding the right types of companies, rather than finding people on certain positions (like VP of Sales), which is what you would normally start from while searching on LinkedIn. Why prospect on other platforms instead of LinkedIn? Looking for software & SaaS companies? Looking for software houses, web designers, SEO and marketing agencies? Looking for marketing folks and experts? Step 1: Look for companies matching your ICP (platforms aggregating companies). Step 2: Look for appropriate people to contact at those companies (LinkedIn). Additionally, searching company profiles on various platforms gives you an opportunity to gather some points of reference for your email copy. You won’t start your cold email intro from the worn-out “Hey, I found you on LinkedIn...”. You will be able to actually write something relevant about the company of your prospect, which can create an appropriate context for your offer. 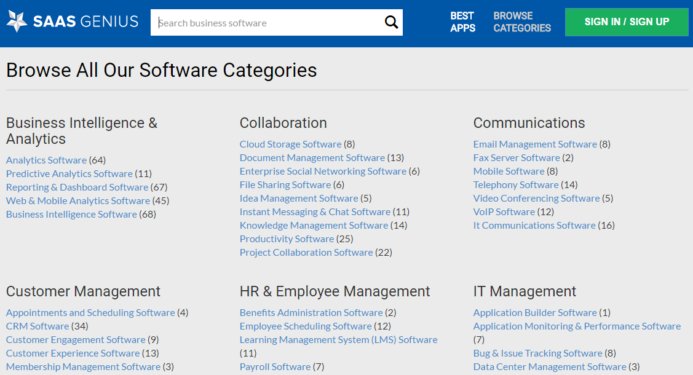 Capterra aggregates software products divided into 400+ categories. Additionally, it offers customer reviews. So you can either look for the b2b leads that match your ICP, based on their products categorization, or you can discover people who use products compatible with your own solution (which may make them ideal prospects as well). GetApp is a place where you can find 4,900+ business apps, also divided into categories which make the search easier and more efficient. Just as Capterra, GetApp collects user reviews, which may be a point of reference for you as well. A similar story here to the two above. Although, G2Crowd seems to focus more on the products reviews. The product profiles are not as detailed as in Capterra and GetApp, though. As the name suggests, this one focuses entirely on SaaS companies. 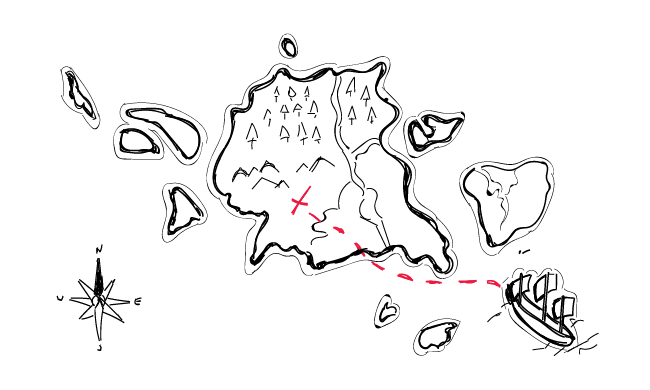 This one is quite new (with a smaller product base), but a well-categorized one with a more narrow focus. 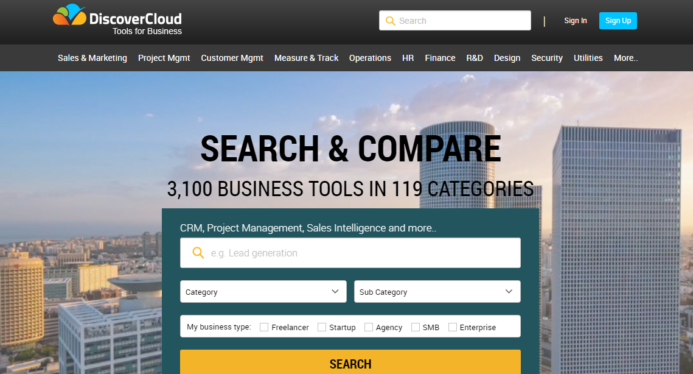 3,100 business tools in 119 categories – the tagline pretty much describes the platform. 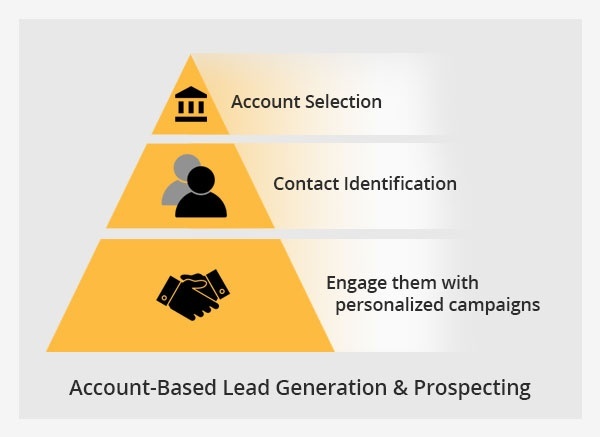 Very similar to G2Crowd, GettApp and Capterra and as good for a b2b lead generation. This one is also similar to those I described above, but it also gives some additional info about the product’s user base. For instance, on the company profile, you can see the countries where the users of the software come from. I bet you know that one. Some prospecting tools even allow grabbing contact details from individual profiles of startup founders and team members. So you have companies and people in one place. A great advantage of platforms like AngelList is that startups actually describe themselves in their profiles, so you can refer to their actual words and views. Plus, you can filter by the investment stage, which gives you some additional financial factor to segment your prospects by. At the moment of writing this post, AngelList includes 2,414,503 company profiles (and actually, these are not only start-ups). If you know Angel, you probably know Crunchbase as well. 27,883 company profiles with descriptions and a quite developed filtering system. For instance, you can filter companies whose description includes a chosen word or phrase. This is something unique for this kind of platforms. I discovered though, that Crunchbase introduced a pro version, in case you want to filter by more than one criterium. So, for instance, if you want to filter sales and marketing companies with 11-50 employees, you need to go for the premium version. Another well-known place featuring start-ups. There are a few categories including SaaS, Apps, Productivity Software and more. If you’re looking for companies at an early stage of development, this place can be a mine of information for you. The company profiles include also the links to founders’ and other team members’ profiles, so it’s convenient to find the people to contact as well. 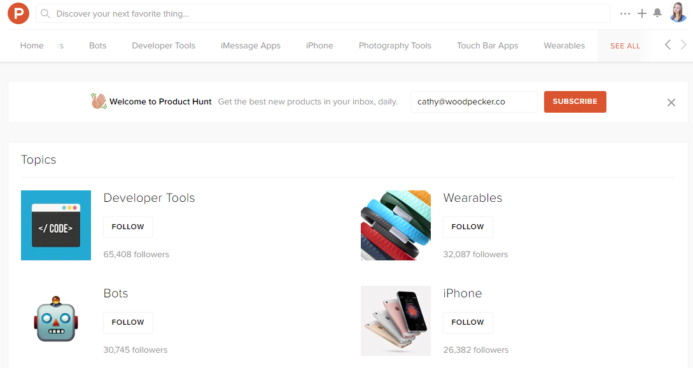 ProductHunt is a platform you can also use for finding b2b leads. Filters are not that extended as on other platforms described in this post, but you can filter by various categories of products and services, called Topics. On the navigation bar, scroll all the way to the right and choose See All. In your emails to b2b leads from ProductHunt, you can refer to the questions and answers under their product posts. Clutch.co is a place that aggregates service providers, including web and software development, digital marketing and web design. If your ideal prospect is a digital service company rather than a product company, this is the place you need to go to for sure. You can filter web development and software development companies by focus (for instance Drupal, WordPress, Ruby on Rails and more). The profile also includes service lines, industry focus and clients’ reviews, which makes Clutch a nice watering hole to draw from. If you have some content to promote, where do you go? GrowthHackers! Your prospects publish their content there as well. So if you’re looking for some experts in a given field, you can find some posts they’ve written. Next, you can craft an opening email including a reference to some of their work. It’s the best point of reference, really, because it starts a valuable conversation with your b2b leads. Same story as GH. Look for the keywords, find the right content and reach out to authors referring to their work. No, it doesn’t just sound like a lot of work. It IS a lot of work. But you can get impressive response rates with this method. So give it a try before your inner lazybones convinces you it’s too much effort. Quora is a place where people ask and answer questions. All kinds of questions. 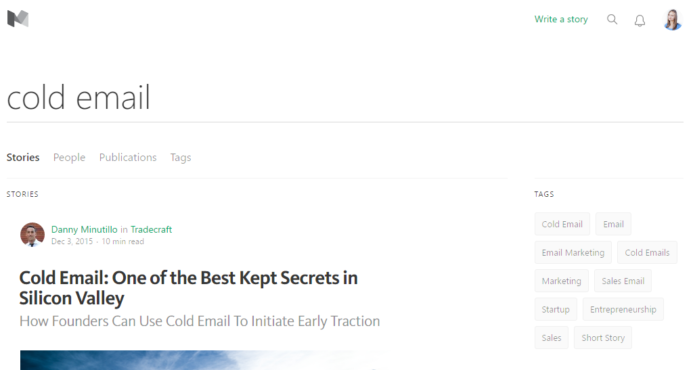 So just like on GrowthHackers and Inbound.org, you can find people interested in specific topics and industry experts. Moreover, you can find people who are actually looking for a product or a service like yours. And you can refer in your email to what they wrote or shared. For me, it’s like many blogs aggregated in one place. The prospecting drill here looks just like on GrowthHackers, Inbound.org and Quora: find the right topic, read the content, add the author to your pospect base, if you decide it’s a good person to reach out to. Undoubtedly, there are dozens of other places on the web where you can look for b2b leads. Think of places where your ideal customers gather to talk and exchange ideas, feature their company, or share some content. For instance, if you’re looking for designers, maybe Dribbble or Behance will be a good place for you? Years ago, I used to look for personal fitness trainers on the web. Here’s where I was looking for. The key is to find the right place for your business and your ICP. Excellent article! Developing a platform is first step further finding prospect and lead is one of the hardest thing for any business growth, Well this is the time of AI and working hard for developing business reach is useless while we have tools for Lead generation like AeroLeads, linkedhub, Rapportive this tools really help us in our business development campaign. Hi, Thanks for the nice article. I`m a b2b lead generation expert. I generally use LinkedIn Premium with my research skills. Cathy! Thanks for sharing these informative post. How many of you knows these 15 places are useful where you can find B2B leads. Yeah Its true, you can gather the list of companies which got recently funded from Angel List, and Crunch Base also has best list. You can get the list of companies from these websites such as Angel List, Crunch Base, Google Maps, Product Hunt, Growth Hacker etc. From the companies list, you can build B2B leads. LeadGrabber MF Pro https://bit.ly/2RUzPdE is a Management Finder tool, It extracts C-Level Executives Name, Email Address, Phone Number from the companies list you’ve given. Build list of companies from any sources and append contact information for your B2B Leads. Excellent Article! Thank you for sharing this informative post. I agree that, Angel list, Crunch Base, Product Hunt are the best sources other than LinkedIn to find potential companies / prospects to who recently got funded, hiring specific skills, growing in size and relasing new products etc. Build your list for marketing outreach. I recommend to use eGrabber’s Management-Finder tool to bulid your target accounts list from any websites. Management-Finder capture companies and append decision makers contact info such as business email, business phone etc.. by deeply searching the internet sources. Build yout targeted account list from any website and any region with the helps of Management-Finder tool. Great Post, Cathy! eGrabber’s Management-Finder is a Account-Based Lead Generation Software that allows you to search & capture companies likely your prospects from Capterra, G2Crowd, Angel List, Crunchbase, BetaList, ProductHunt etc. Then, you can use LinkedIn to find Decision Makers in companies. Step 1: Look for companies matching your requirements. Step 2: Look for Decision Makers to contact at those companies (LinkedIn). Management-Finder deeply searching the internet to find decision makers & their verified business contact informations such as email address & phone no etc. Great article Cathy! You can also find unlimited B2B contact details on https://datajar.io and all the business email addresses are verified in real-time to reduce bounce rate.